Luosim is the southernmost region of Nalbadonas, consisting of the Isguin peninsula and the northern coast of the White Sea. The westernmost tip of the Chakkom peninsula across the straits of Belberan in Kenemas is also considered part of Luosim. Its largest settlement is Umorit, once the seat of the expansive Umorit Empire. 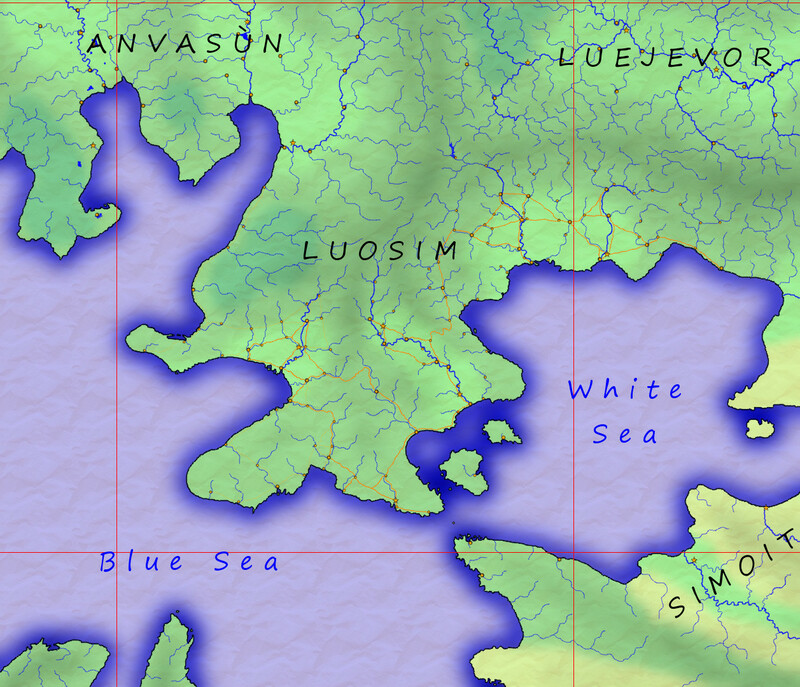 The bulk of Luosim's territory is the Isguin Peninsula. The metropolis of Umorit is the largest human settlement on the Continent of Nalbadonas. The city of Uvai, located on the northern coast of the White Sea, was historically the first conquered by the Umoritians. The city of Sinneshuon is on the Isguin peninsula on the shores of the White Sea at the mouth of the river Goun. Ekkezie is in the central Isguin peninsula on the river Goun. Ciekoppion is a metropolis near the straits of Belberan between the White Sea and the Blue Sea. It is a very important trading port. The Blue Sea Trading Company lodge captain is Giogan. Songspring Abbey is located on the Chakkom peninsula, on the shores of the Blue Sea.